In this section you will find answers to some of the more frequently asked questions about the SRS200-S "Avalanche" system. Q- How does this system work? A- Our system works much like a multi blade personal shaver. There are 4 heavy duty rubber blades, all of which are set at different heights. The deeper the snow on the roof of the trailer, the more aggressive the blade becomes to remove it. Q- Does it work on ice? A- When ice forms on the roof of a trailer it tends to get a very firm grip on it. This system has not been designed to, nor does it attempt to remove ice buildup. Prevention is the best cure for ice removal. It only takes a couple of moments to remove snow from a trailer prior to docking, thereby reducing ice formation. Q- Is the blade adjustable for different trailers? A- During installation the blades are adjusted to suit the height of one of your trailers. 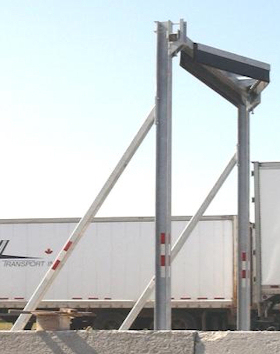 It is highly recommended that the trailer being used for this purpose be of industry standard height (13' 6"). Q- Does the blade move up or down? A- Once the blade has been "set up" it is securely locked in place. This insures that the blade will not move under adverse snow conditions, thereby helping to eliminate any danger of damage to either the trailer or the "Avalanche" system. Q- Is there much clearance in between the roof of a trailer passing through the system & anything that may harm the trailer? A- Our system has been designed to allow 6"-8" of clearance in between the roof of the trailer & any structural members. Thus insuring worry free operation. Q- How much maintenance is involved in a system such as this. A- All of the fasteners are plated, and all of the steel members of the "Avalanche" itself are Galvanized. This type of coating helps the "Avalanche" to stand up to the arduous conditions that the various seasons deliver. Thus allowing for many years of service without any need for additional coverage. However a general inspection of the unit is required at regular intervals throughout the season. This includes the structural members, the fasteners as well as the blades themselves. Q- How often do the rubber blades require replacement? A- This is completely dependent on the frequency of use as well as the type (coarseness) of the snow that the system has been subjected to. It is recommended that everything on the system be checked thoroughly prior to seasonal use.